The Italian Renaissance is considered by many to mark the beginning of the modern age, the name itself - literally meaning 'rebirth' - accurately expressing the innovation that took place during this period. Renaissance thinkers took a vital interest in history, literature and the arts, focusing on the human world as much as, if not more than, that of God; and the rapid development of the arts and sciences reflected their study of the visible, physical world in all its three-dimensional glory. 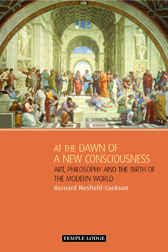 The source of these new impulses, says Bernard Nesfield-Cookson, is to be found in what Rudolf Steiner referred to as the birth of 'the consciousness soul' - the faculty for 'objective self-awareness'. Instead of a primarily inward-looking consciousness, people began looking outwards with greater intensity, observing the world around them in detail. Conscious of their separate being, they began to study the phenomena of the world of nature from an individual, personal standpoint. BERNARD NESFIELD-COOKSON has led a varied professional life as a businessman, school teacher, lecturer and writer. Most recently he was principal of Hawkwood College, an independent centre for adult education. He is the author of several books, including Michael and the Two-Horned Beast and The Mystery of the Two Jesus Children.